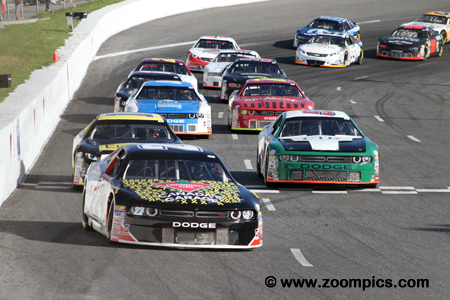 In September 2006, NASCAR announced the purchase of Canada’s premier stock car series - CASCAR. They also revealed a long-term sponsorship agreement with the Canadian Tire Corporation. The series’ first event took place in 2007 at Cayuga Speedway. The first season included many of the teams that had previously participated in the CASCAR series. The 2015 championship opened at Canadian Tire Motorsport Park as it had done since 2012. 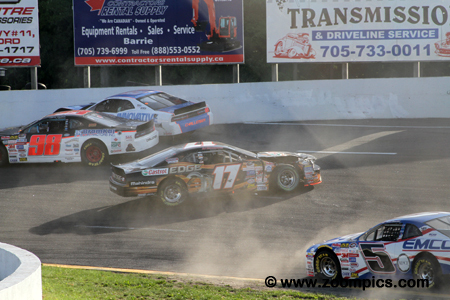 The schedule looked much as it had in 2014 – the exception was the introduction of Sunset Speedway following the closure of Barrie Speedway. 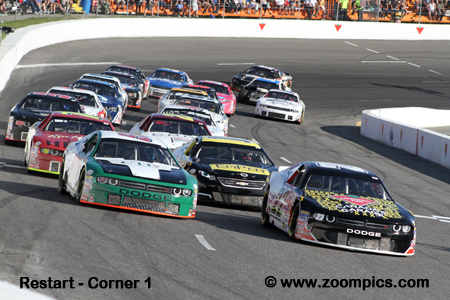 The opening round was followed by Autodrome Chaudiere, Sunset, Circuit ICAR, Edmonton International Raceway, Auto Clear Motor Speedway, Autodrome Saint-Eustache, Circuit Trois-Rivieres, Riverside International Speedway and the second visit to Canadian Tire Motorsport Park before ending the season at Kawartha Speedway. The series cars are constructed to specifications and rules common to most stock car series. The chassis is a steel tube frame covered with a fiberglass body that is required to weigh no less than 3000-lbs. Body styles are from manufacturers such as Dodge (Avenger, Challenger and Charger), Ford (Fusion) and Chevrolet (Monte Carlo and Impala). Engine type and displacement are related to the make and model of the vehicle. The carbureted eight-cylinder motors produce approximately 600-horsepower. With the demise of Barrie Speedway, NASCAR series personnel had to locate another facility to host the Leland Industries 300. That race track would be Sunset Speedway which like Barrie is a .333-mile oval. Twenty competitors would take the Starter’s green flag for 300 laps of racing. Scott Steckly in the No. 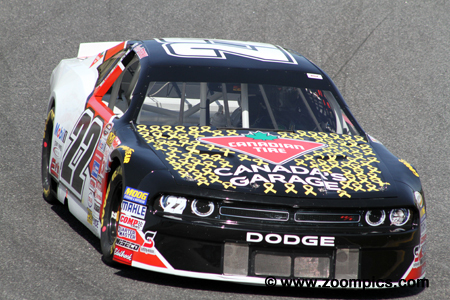 22 Canadian Tire Dodge Challenger got the better of pole-sitter, Gary Klutt at the start. Steckly was in the lead before the end of the first lap. 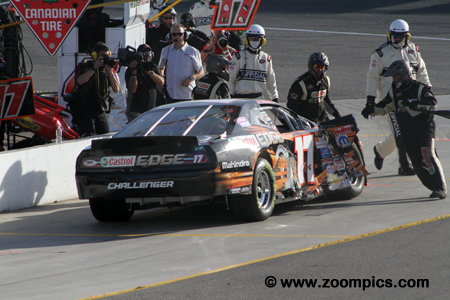 Klutt was also challenged for position by fourth fastest qualifier Alex Tagliani but was able to hold him off. Next Klutt had to battle the hard-charging Cayden Lapcevich. Alex Tagliani driver of the No. 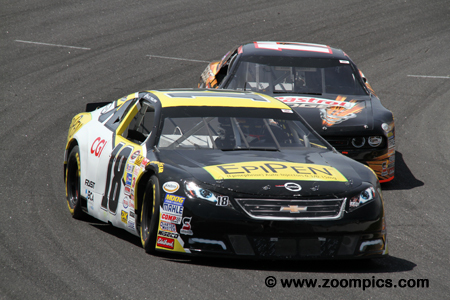 18 EpiPen/CGI/Cantorque Chevrolet Impala started from the fourth position on the grid. During the first third of the race, Tagliani stayed in contention. On lap-108 he moved out front and was the first to cross the finish line after 300 laps. This was Tagliani’s second series victory but of significance was that he lapped the entire field – the first time in series history. On lap-9, sixth place starter, Anthony Simone and D.J. Kennington the eighth fastest qualifier tangled in turn two. It took Sunset facility personnel several laps to clean the track. Both cars suffered damage and required a number of pit-stops for repairs. Simone retired his Dodge after eighty-one laps with overheating problems. The next and final caution of the race was not until lap-288. D.J. Kennington was not a contender after his accident with Anthony Simone. He pitted the Castrol Edge/Mahindra Tractors Dodge Challenger several times throughout the event - while the crew attempted to make repairs. Kennington was the last car running, he completed 244 laps and finished in sixteenth place. Sunset Speedway Super Stock champion and NASCAR rookie, Cayden Lapcevich topped the time-sheets in both practice sessions. 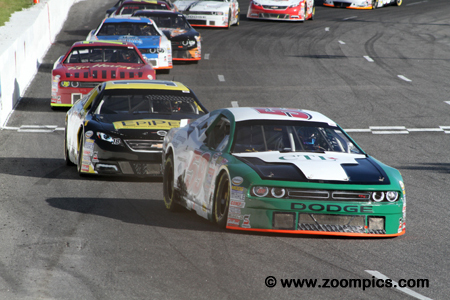 In qualifying, the driver of the Tim Hortons-sponsored Dodge Challenger was third quickest. During the race, Lapcevich led a total of forty-five laps and he was the highest placed rookie securing a third place finish. 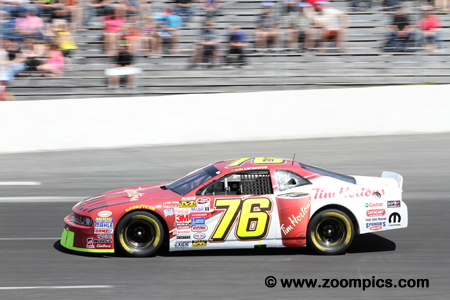 Three-time NASCAR Canadian Tire series champion, Scott Steckly, qualified on the outside of the front row. Steckly took the lead at the drop of the green flag and led the first sixty laps. He would lead a total 62 laps a distant second to Tagliani’s 193. At the checkered flag, Steckly was in fourth place. Jean-Francois Dumoulin was not demonstrating any speed during the practice sessions – he appeared in the bottom half of the time sheets. In qualifying, his performance did not get better and Dumoulin qualified sixteenth out of twenty starters. During the race, he improved on his starting position and with less than twenty-five laps left in the contest he passed Alex Labbe for a fifth place finish. 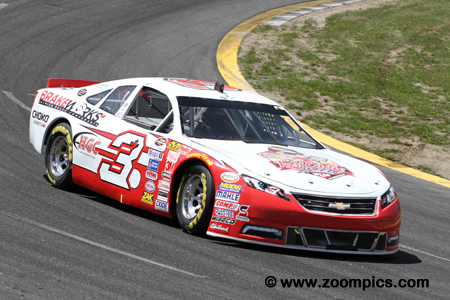 For the second time in three races, rookie Gary Klutt captured the pole position – he was the fastest qualifier in the season opener at Canadian Tire Motorsport Park. Klutt’s first place was short-lived as Scott Stecky passed him for the lead before the end of the first lap. He would finish three laps behind the winner, Alex Tagliani, in sixth place. Series contender, Jason Hathaway driving Brakeworks/Fast Eddie/HGC Transport Chevrolet Impala, qualified mid-pack in ninth position. 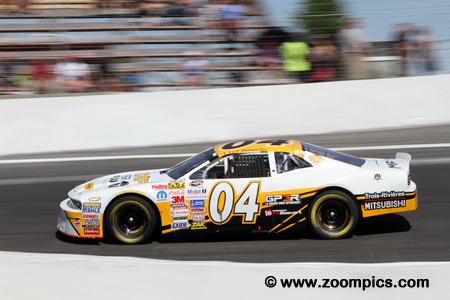 Hathaway was the winner of the previous weekend’s event at Autodrome Chaudiere. He moved up the race order and by lap-278 Hathaway was in second place. He maintained this position to the checker - finishing one lap behind the race winner.